Known as one of the great jazz musicians, Sidney Bechet composed more than 200 pieces during his career, including the famed “Petite Fleur”, “Dans les rues d’Antibes” and “Les Oignons”. Daniel Bechet, Sidney’s only son, is a percussionist and drummer and has put together a quintet to pay tribute to his father. He’s sought out some of the best musicians by partnering with the Olivier Franc orchestra. A clarinettist and soprano saxophonist, Franc is a winner of multiple awards from the Académie du Jaz and the Hot Club de France. He is one of the major exponents of traditional jazz in France and widely recognized as the most talented disciple of Sidney Bechet. A regular guest of Wynton Marsalis, he has even had the fortune to play on Bechet’s personal saxophone. 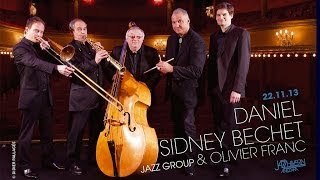 The quintet performs Sidney Bechet’s most famous works, as well as some lesser-known compositions from his American period until 1949. Their repertoire also includes original material and new compositions by the orchestra, plus a selection of classic jazz numbers.